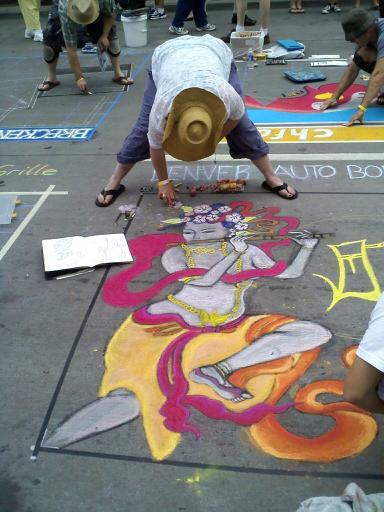 Today was the trifecta of free activities in downtown Denver (not including food, of course). 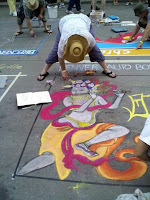 Our first stop was the Denver Chalk Art Festival which was amazing. The closest thing I can compare it to is cross stitch, where you break down a complicated picture into little grids and get to it....or that chalk picture I did of a tiger in elementary school, following the same grid idea. Brilliant colors. I need to spend more time on Larimer Square. There was a fun shop called Posh that had the best selection of cards for every occasion imaginable. Also a book called Booze Cakes that may have to join my collection....everything I've ever baked with alcohol has been delicious. Second stop was the People's Fair in Civic Center Park. A general excuse to be out in the sun, listen to music and eat food on a stick. I opted for chicken on a stick as my entree. But it has nothing on our dessert. 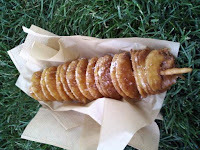 I was thinking I would get a funnel cake, a traditional fair treat, best enjoyed by more than 1 person no more than 3 times in one year. But then we saw the sign. Apple Swirl Thing. 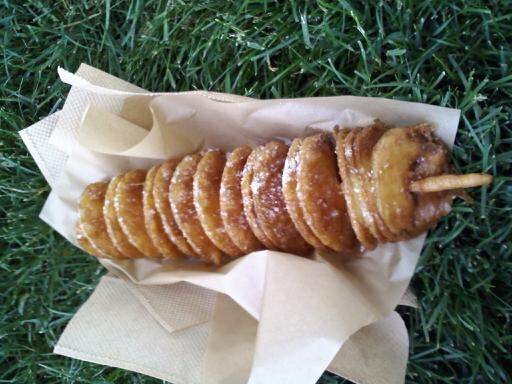 A spiral cut apple on a skewer fried and then topped with cinnamon, powdered sugar and caramel. Funnel cakes may always be second place. 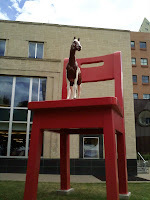 Then we remembered that the first Saturday of each month is free day at the Denver Art Museum! The DAM is conveniently located right next to the park, so culture and AC were within close reach. Even better, is that when it's free day, you feel "free" to pick and choose what you want to see and not to cram it all in as you might when paying $10. So we got into the spirit of Western, European and Asian art, including a furniture gallery where people had actually written commentary and drawn pictures of the various chairs. We made our own guesses of which chairs looked suitable for time-outs, the kids table, your least favorite guest, or a good book. I was suprised with the amount of activities for kids, including I-spy and bingo. In the Nepal/Tibet section there was a tapestry of the 10 Inauspicious Sins. Sadly there was no explanation, and I couldn't determine the sins on my own and google isn't helping much either. 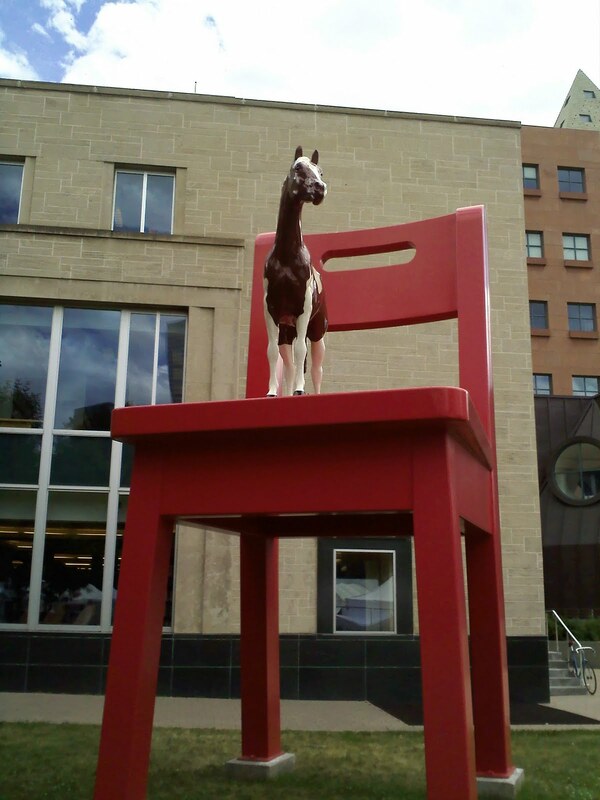 The horse on a chair is in front of the Denver Public Library, though. Did you go there, too? That would be one more thing to add to your list... Btw, they have a major book sale coming up.